Take a one-minute survey and be among the 100 customers who get 70% off their first three months with MxMail! The platform ensures a reliable email delivery service with a built-in email verification feature. 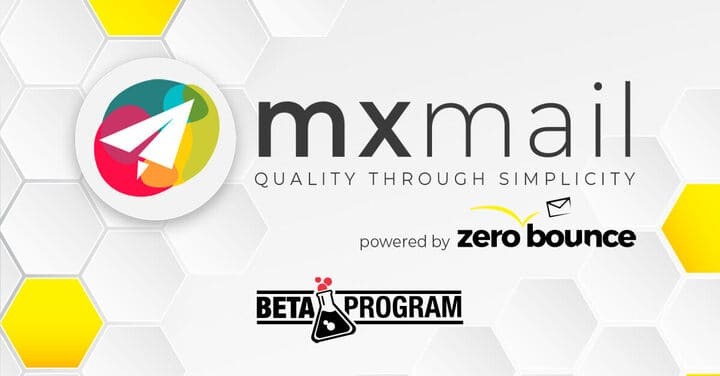 We’re thrilled to invite you to an exclusive Beta Test to try out MxMail, the email service provider (ESP) powered by ZeroBounce. Actually, MxMail is more than your standard ESP. It’s a new age ESP that cleans and validates your email list in addition to sending email campaigns. Start validating and send your marketing emails seamlessly, all in one! If this exclusive Beta Test piques your interest, we would appreciate your feedback. So, we’re extending the invite to a few select customers to take a really quick survey. 100 respondents will get the chance to sign up for MxMail at 70% discount for the first three months! As your email list grows, the risk of it becoming unsafe grows, as well. Especially if you don’t have an email verification API installed on your signup forms. The API checks new subscribers in real time and, in a matter of seconds, determines whether their email addresses are valid. You also have the option of using a bulk email verification system. It checks your whole email list and removes bad signups. Catch-all, abuse, disposable and spam trap emails are risky to your email deliverability, as they tarnish your sender reputation. Email list cleaning has thus become a common email marketing best practice. As an email marketer, we know you have to juggle with so many responsibilities. You have to write compelling copy, create nice-looking email design, and make sure your emails render well on all devices. At the same time, you want to focus on your email hygiene so your emails reach the inbox. Thanks to its ZeroBounce integration, MxMail takes care of your email list by cleaning it automatically. Once your database is validated, you can go ahead and create your campaigns. you get a clean and safe email list – no misspelled, dormant, or fake email addresses. No spam traps, catch-all, abuse or disposable emails either! MxMail offers you in-depth reports about your subscribers, so you can customize your content for the best engagement. Ready to upgrade your email marketing? Take the survey and get your 70% off coupon code!